La-La Land Records and 20th Century Fox Music presents the 50th ANNIVERSARY release of the original score to the classic 1961 underwater adventure VOYAGE TO THE BOTTOM OF THE SEA, starring Walter Pidgeon, Joan Fontaine, Barbara Eden and Frankie Avalon and directed by Irwin Allen. Composers Paul Sawtell and Bert Shefter (FASTER PUSSYCAT, KILL KILL, HAWAIIAN EYE, VOYAGE TO THE BOTTOM OF THE SEA TV SERIES) create a thrilling orchestra score to this hit feature, which would spawn the classic TV series of the same name. Produced by Nick Redman and remastered by Mike Matessino, this special limited edition release features both all-new artwork and exclusive, in-depth liner notes by film music writer Randall D. Larson. While the music content of this CD is the same as the FSM release, it has been remastered and the damaged track fixed. 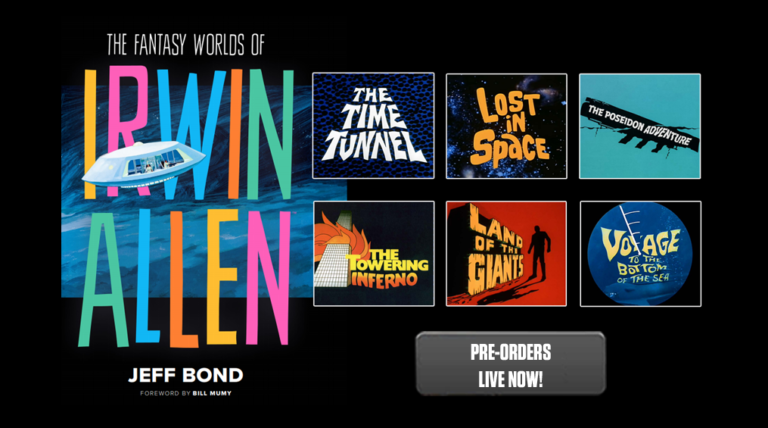 ORDER THE AMAZING BOOK "THE FANTASY WORLDS OF IRWIN ALLEN" by Jeff Bond now!